I love when the summer produce is at it’s peak, and that is right now! I always get carried away it is all so beautiful. I buy too much! Saturday at the Zero K market, where it all comes from right around here, I bought what you see in the picture below. On the right (above the arugula and next to the bowl) there are four small red/orange eggplants. I have never seen this color before. I am going to try them in a pasta sauce. I got our first watermelon and I’ll serve it with feta as a salad. The red and white beans are here all summer and I will probably add these to a sausage based pasta sauce. The heirloom tomatoes in the bowl are so sweet and perfect right now. I hope the nice man who is so proud of growing them keeps coming. He has all the types I am used to from the US. I remember last year he only came one time. It was very wet and I imagine he lost his crop. This year is hot and great for the tomatoes and this was his fourth week here. The peaches on the right are apparently very famous and from Monte Corona. They sell them on Saturdays out of an old monastery and also at the market in Umbertide. We drove over to the monastery and were amazed at the caravan of cars buying them. Who knew!? Last night I made fajitas! It has been a long time. I actually had to make the flour tortillas myself. They are much better than what we got in the US stores too. I had to use ghee (which I had brought with me) instead of the vegetable shortening. I need to see if they have anything like Crisco here. I made a nice salsa with fresh tomatoes (YUM) and onion, lime, and diced jalapenos from my pepper plants. Spicy and good! I grilled onions and peppers and then grilled the steak that I had marinated overnight in cumin, chili powder, garlic and onion with some lime juice and oil. The fajitas came out great and I’ll make them again. 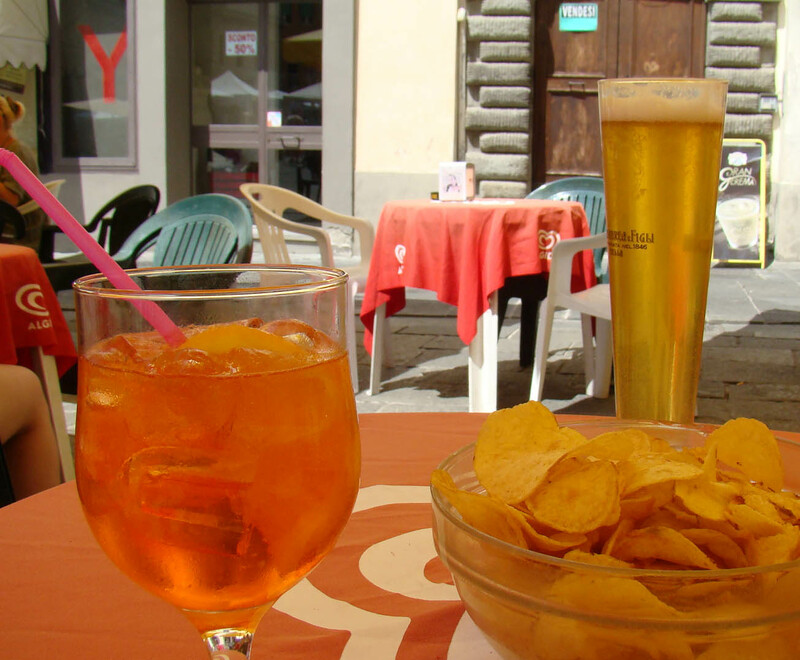 And lately I have been enjoying my new favorite drink – an Aperol Spritz. So refreshing. It is 3 parts Prosecco, 2 parts Aperol and a splash of soda with a slice of orange. The taste of the Aperol is quite bitter so it is not a cloyingly sweet drink. Tastes great at the Bar Mary on the Piazza or anywhere else! Finally I was contacted by a man in NYC who does the casting for House Hunters International. He sent me a VERY extensive questionnaire. I guess most people know that the show is about people who buy houses abroad. Maybe you didn’t know that they are filmed after the fact. For instance, if we were chosen to do a show they would fly us back to Virginia where they would film the “back story” of us before we flew off to look for a house in Italy. They would do a one day shoot. Then they would do four days here in Italy of us looking at three houses one of which would be our house. They would pack up and move all of our stuff out of the apartment to put it back to the way it was before. Then they put all our stuff back and film us after we had moved in. I am of two minds about this. Seems quite disruptive especially because we are in the Centro and they would be filming and moving stuff about. Not sure how the Umbertidese would feel about that. We probably won’t be chosen anyway but it is something to think about. 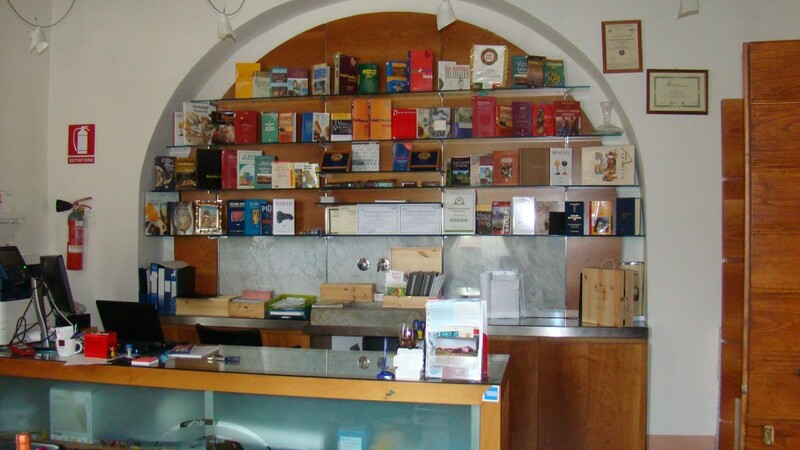 This entry was posted in Eating, everyday life in Umbria, geometra, Umbertide, Uncategorized on July 27, 2015 by Nancy Hampton. Nancy and I are travelling to the Tuscan town of Montepulciano to have lunch with friends at La Grotta, one of our favorite restaurants. Given that I have to go anyway–I’m hardly fighting it–I’ve decided to interrupt my researches here in Umbria and check out some Tuscan wine. No sense missing an opportunity to try something new. 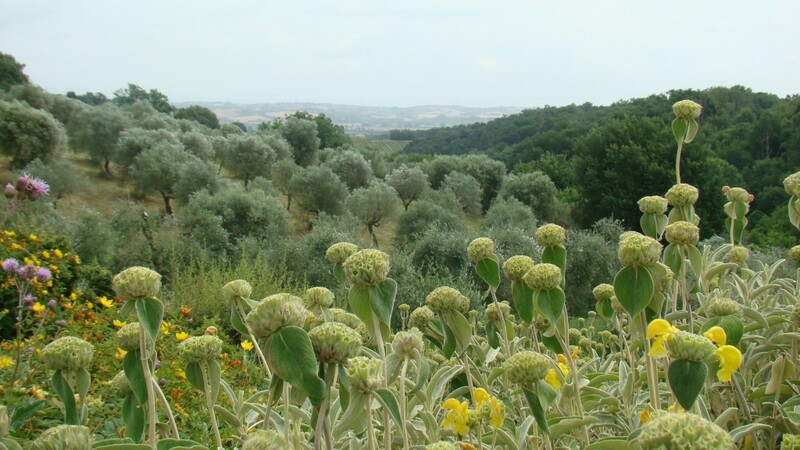 I’ve targeted the Tenute del Cerro, a well known produttore in the district of Acquaviva, a few kilometers east of Montalcino in the rolling Colli Senesi–the Sienese Hills. We have decided to take the direct route, the Super Strada SS140 (take this description with a grain of salt) which winds back and forth across the Tuscan-Umbrian border, climbs to about 1800 feet and descends to the lovely town of Tuoro on Lake Trasimeno, Italy’s largest (outside of Guarda) and and one of its most beautiful lakes. From here, we follow the autostrada to Florence for a bit and then swing south-west on the SP10/SP8 through rolling hills and tidy, picturesque villages towards Montepulciano. Time for some background: The Tuscans and the Umbrians don’t like each other very much. Throughout most of the middle ages and up to the establishment of united Italy in the 1870’s, Umbria belonged the Papal States: that is, it was a possession of the Catholic Church. 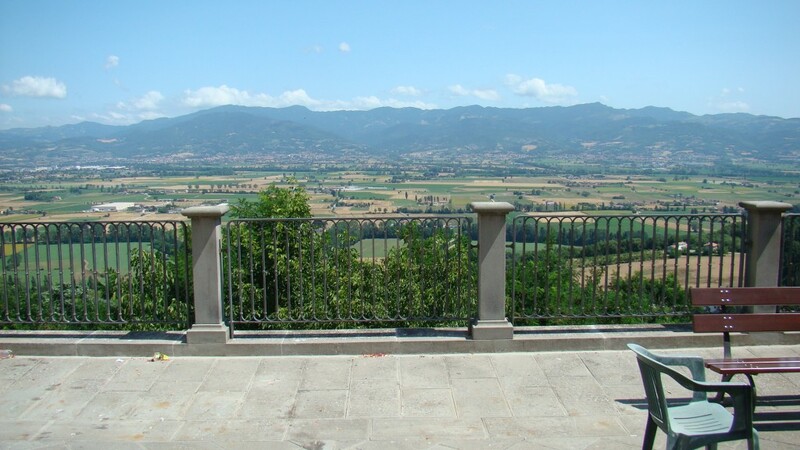 Tuscany at the same time was the site of feuding dukedoms struggling to control the province. During this time, Tuscany played unwilling host to foreign armies from France, Spain, Germany and Austria as well as armies from “neighbors” such as Venice, Milan and Naples. History has definitely been a bit messier there. In any case, the Tuscans see the Umbrians as happy-go-lucky, rather simple peasant folk who have lived their lives as welfare kings and queens in the bosom of the Mother Church while they have always had to struggle for their existence. The Umbrians, on the other hand, see the Tuscans as crude money-grubbing materialists who have lost all touch with the virtues of the simple life and who take advantage of their cultural heritage to squeeze every nickle out of the hapless tourists who visit them. Enough of these musings–back to wine. 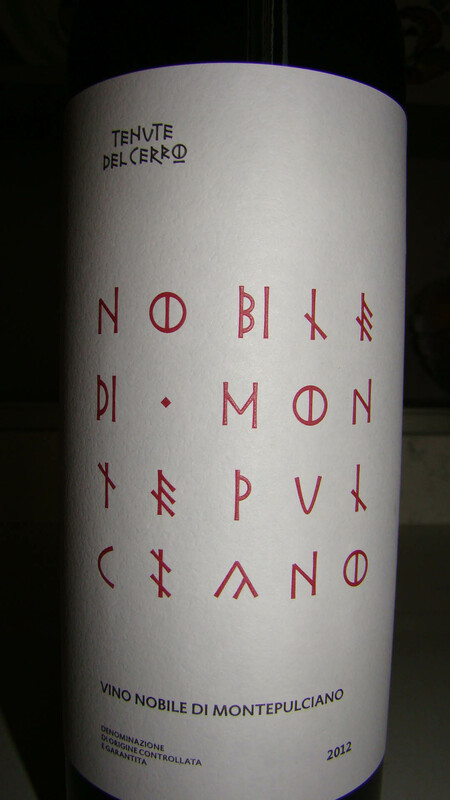 The odd thing to remember about the Vino Nobile di Montepulciano is that it doesn’t have any Montepulciano grapes in it. The Montepulciano grape is the heavy hitter of the central Adriatic coast, appearing in excellent wines such as Montepulciano d’Abruzzo, Rosso Piceno and Conero. The Vino Nobile, on the other hand, is, like most Tuscan wines, made primarily from Sangiovese. The town of Montepulciano, due to its fame, was granted a DOC of its own in spite of the confusion. In fact, the town of Montepulciano is so famous in winemaking that Il Vino Nobile di Montepulciano became the first DOCG created. 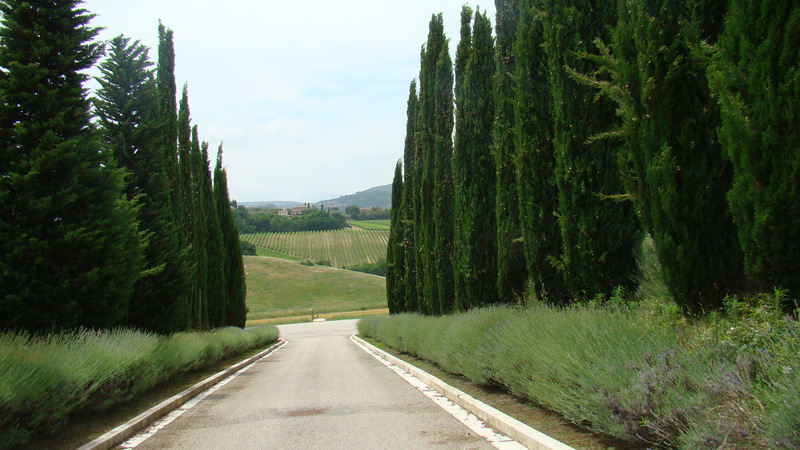 Although the winery, Tenute del Cerro uses the small town of Acquaviva di Montepulciano as its address, it is actually about 5 kilometers outside the town on a “white road”. “White Road” in Italiance parlance covers anything from a dirt road to a goat path. This one was on the finer side, being a dusty country gravel road just big enough for two cars to squeeze by. We tried ignore all the gravel banging the bottom of the car as we made our way gently through rolling fields of green grapes overlooked by gorgeously painted Italian country houses. At a small bend in the road, we spied our goal. 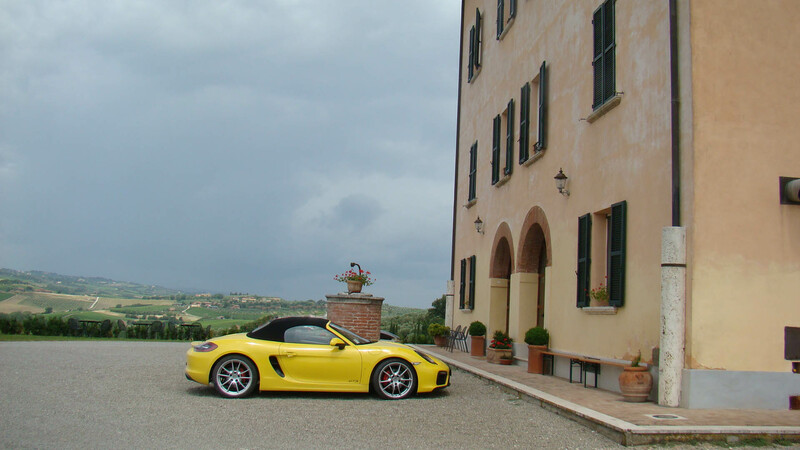 The Tenute del Cerro consists of an elegant, gated entrance forking in one direction to a truely elegant palazzo, the Villa Granzianella, an agriturismo with meals and rooms, on one side and the lovely cantina Tenute del Cerro on the other. 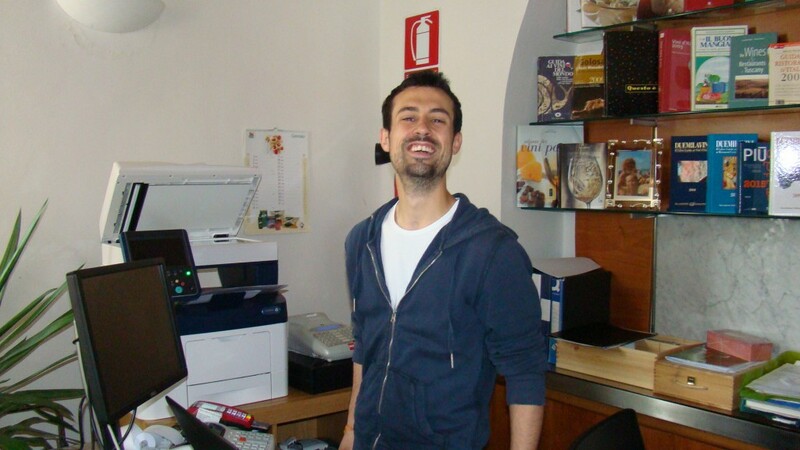 We were greeted at the cantina by Giovanni, a tall young man in his mid twenties from Milan who is doing an internship here as part of his studies in Hospitality Management at the University. He is aiming to specialize as a sommelier–why didn’t I think of this instead of engineering? He gave us an interesting talk on the property, the Etruscan surroundings and the winemaking on the property. The winery is very proud of its ancient Etruscan heritage, and pays homage to it through the labels it uses for its wines. 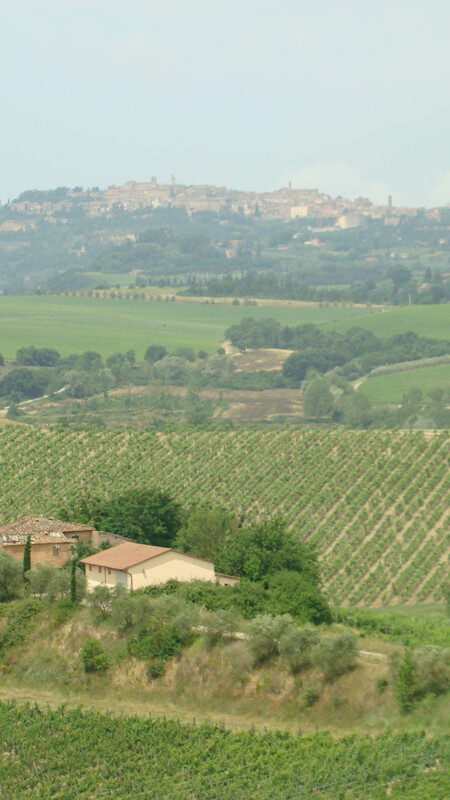 Montepulciano on it’s hilltop nearby. 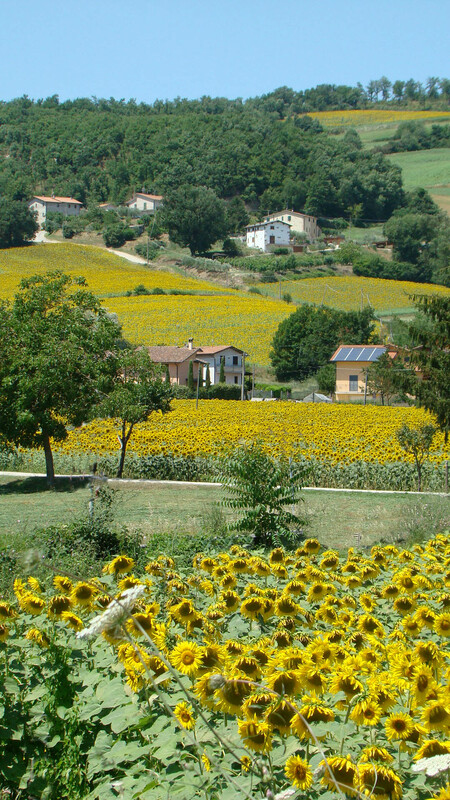 View across the vine-laden countryside. 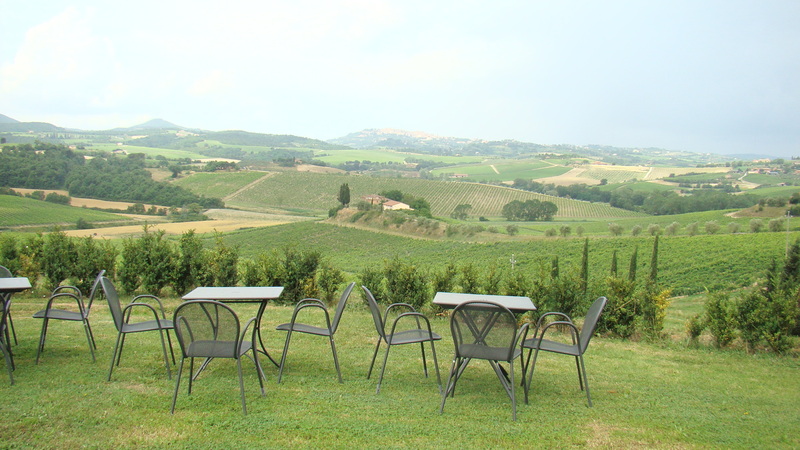 Seating on the lawn of the agriturismo. Beautiful views. Our first tasting was a pleasant surprise: the Vermentino 2013. Vermentino is a white grape that I have always associated with Sardinia, although it does appear under various other names in the Piedmonte, Liguria and Corsica. I’ve always found it rather light and inoffensive, but unremarkable in character. If you can remember the days of Bolla Soave, you’ll have an idea where I’m coming from–it goes down nicely but makes hardly any impression. 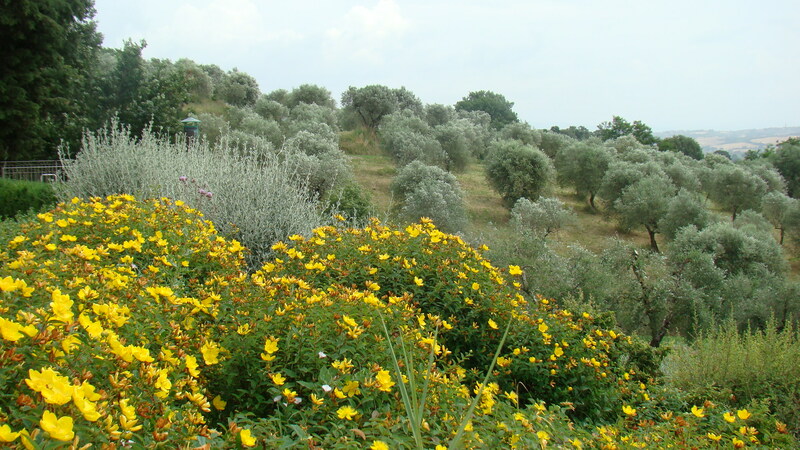 I was surprised to find that it is cultivated to a modest extent in Tuscany. This 100% Vermentino was big and fat in the mouth, unlike the rather thin impression that most Vermentinos have made on me it the past. It had a lovely straw color, with a fruity nose. I found it a bit mineral and steely on the tongue with a nice long finish. A definite keeper for a nice house wine and I’m sure it would go nicely with fish, pasta or light white meats. I’m going to have to extend my investigation of Vermintino to see if the Sardinians are keeping the good ones to themselves, or whether this is just a Tuscan terroir effect. We followed the Vermintino with a Chianti Colli Senese 2012. Although the property specializes in Vino Nobile, the winemakers feel that there are many other varietals that blend extremely well with Sangiovese that produce lighter, more fragrant and more immediately drinkable reds than the Vino Nobile, which is a wine of considerable heft and requires aging. 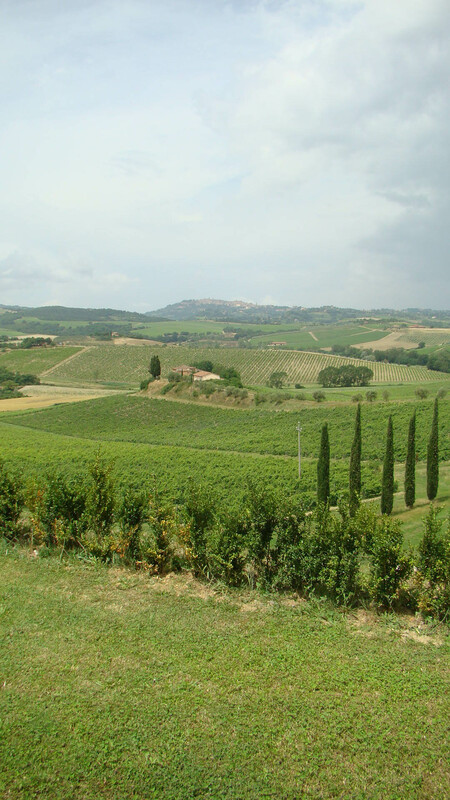 Because Montepulciano lies in the Colli Senesi (Sienese Hills) district of Chianti and these blends meet the requirements of the DOC Chianti Colli Senese they are sold as such. This chianti was a light cherry with ruby undertones. It was light and tingling on the tongue, with great fruit and a tiny touch of tannin from six months in large oak barrels. It had an excellent finish, leaving just a hint of jam. 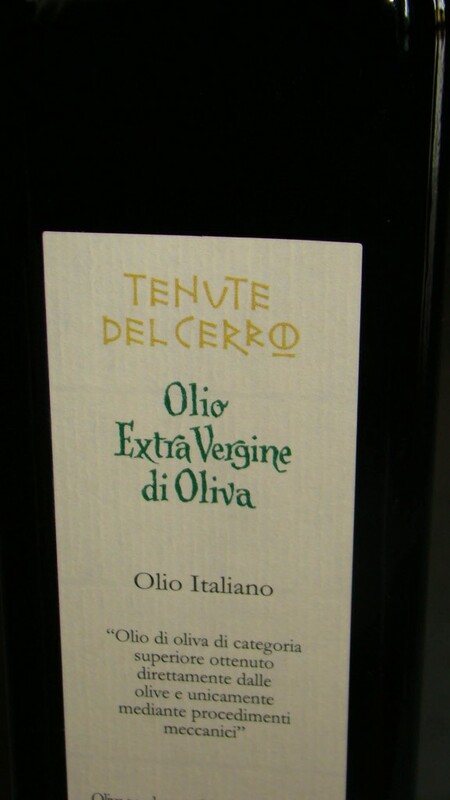 Given its character, I think it would make a great accompaniment for pasta, pork and grilled meats. We have enjoyed it several times with pastas with red sauce and chicken and it has been perfect. These labels are using a text font reminiscent of the ancient Etruscan writing. 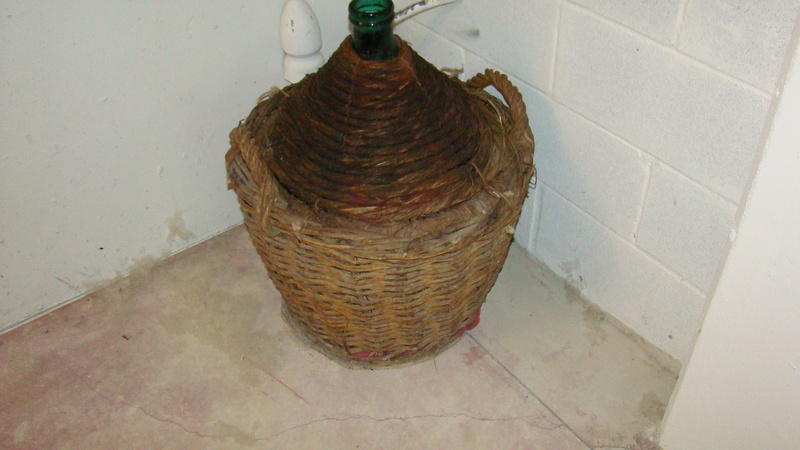 This is the Chianti. The Chianti was followed by the centerpiece, the Vino Nobile di Montepulciano 2012. This wine, 90% sangiovese and 10% mammolo, an antique tuscan grape that confers a vivid purple hue to the wine. (For trivia lovers: Mammolo is what the Italians call Bashful of the seven dwarfs.) The wine has an imposing color, the cherry red of the sangiovese darkened by the purple tint of the mammolo. The nose is floral, with a hint of vanilla. In the mouth it is very full, with a moderate touch of oak from 12 months in large slavonian oak barrels (botte). The wine sports a moderate touch of tannin that tells me it would be rewarding to lay this down for a while if you are capable–I am not. Giovanni is of the opinion that it could go about ten years. It is one of the best Vino Nobiles I have tried in a while. 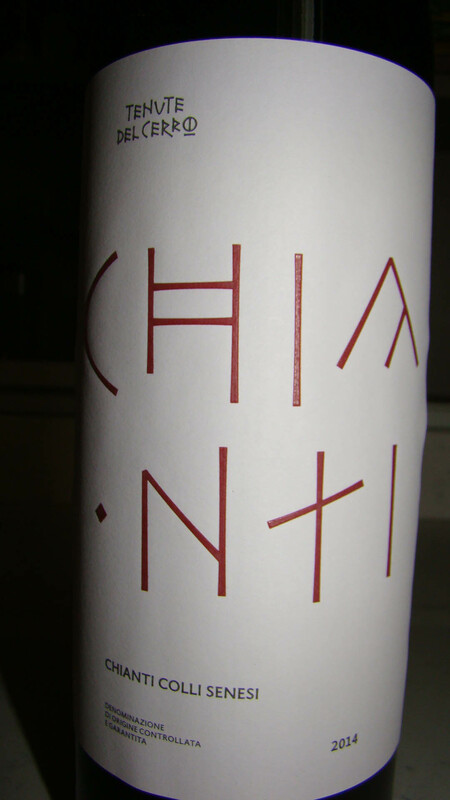 Although we begged for more, the top of the line Vino Nobile “Antica Chiusina” had been drunk up–damn you British or German tourists or whomever! Another reason to return for further investigation, so I’m not completely down about it. In place of the Antica Chiusina, Giovanni surprised us with an alternative offering he was very fond of, a Sagrantino from Umbria(!). It turns out that Tenute del Cerro is one of four autonomous wineries owned by Unipol, a large insurance agency. 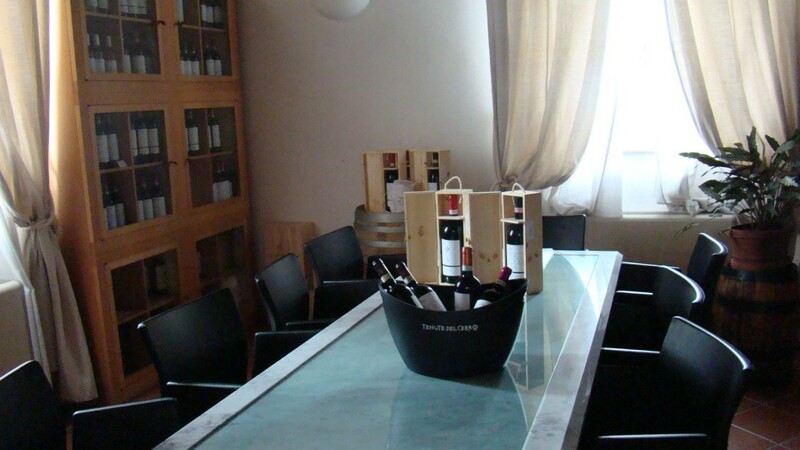 The other wineries are: la Poderina in Montalcino; Monterufoli, in the Val di Cornia outside Pisa; and Còlpetrone, near Montefalco. We decided to pass on the offer. There’s no sense getting ahead of ourselves in our investigations. Besides, lunch was calling in Montepulciano. Naturally with a nice bottle of the Vino Nobile. More on that later. Ciao! This entry was posted in Uncategorized, Wine and wineries on July 25, 2015 by Nancy Hampton. We have been dealing with a heat wave for almost two weeks. It is getting into the upper nineties to the low hundreds and predicted to last another week. No rain either so it is very dry. Luckily it has not been terribly humid, and it does cool off as soon as the sun sets. We are still able to sleep with the windows open and a fan. We have been using the AC in the living room in the afternoons. We do what I call “window and shutter management”. At night all the windows are opened wide to encourage the cool night air to come in. In the morning I generally sit on the terrace to take advantage of the coolness. About 10:30am or so I close the shutters on the piazza-facing side of the house and I close the windows. This makes it dark and cave-like. The windows facing the river I leave open for a while longer but as the sun comes over the house they too are shuttered and closed. The living room gets hotter because it has no attic. And it is a big room with a big window with no shutters. It does have the shear shade that I close. That said, I am working in the office right now and it is very hot in here. We eat at about 8pm and mostly we eat outside. The sun is setting just after 8pm now. We have a small TV that we use on the terrace. It is lovely to sit out there and watch a movie of an evening. So now you know how we are beating the heat… or not as the case may be. 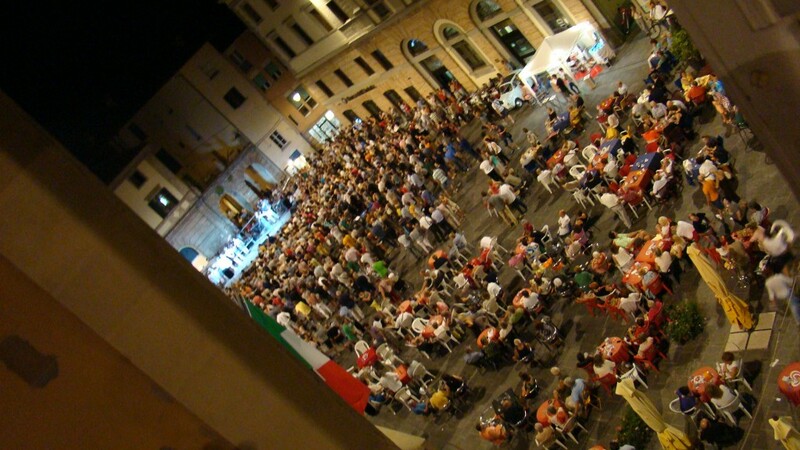 Last Friday we were treated to a concert in the piazza. DikDik was the name of the band. They drew quite the crowd. They are a 1960s band that mostly did English tunes translated into Italian. For instance, they did “Hey Jude” and “California Dreamin'” to name two. We sat outside at Bar Mary and enjoyed people watching. They had a hair dresser setup in a tent where women were getting up-dos a la the 1960 beehive look. Later they had a contest. We retired upstairs just when DikDik started at 11PM. But of course we could hear them just fine up here! Yesterday, Sunday, we planned to go to “Movie night at the castle”. This is the Civitella Ranieri castle that I have written about before. They invited everyone to bring a picnic and eat on the lawn. Then we all went into a courtyard where a sheet was hung to project the movie. It was a 1960s black comedy called Mafioso. It is out of print and has been deemed notable enough to be saved by the Criterion Collection. It was a beautiful evening and just being at this beautiful 15th century castle is a treat. Here are our friends Michelle and Paul and Luther at our picnic. Tomorrow we have plans to attend a performance by the Royal Conservatory of Scotland of excerpts from Rossini called “Raucous Rossini”. It only lasts one hour and is being performed in the Teatro dei Riuniti here in Umbertide centro. 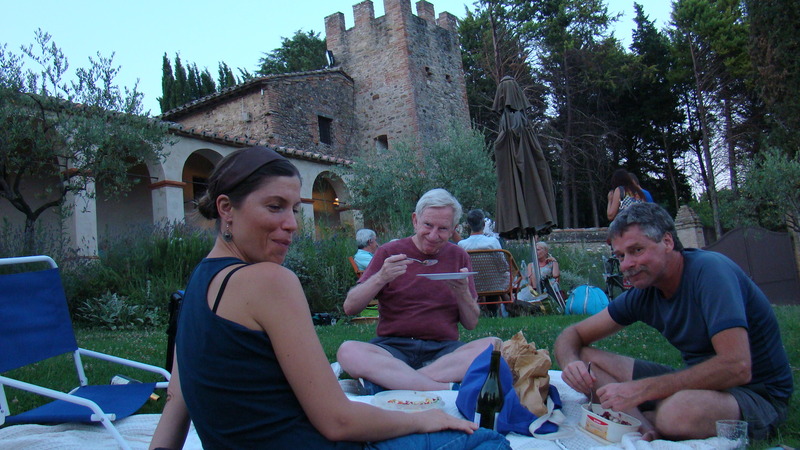 It is in a medieval building that sits just next to the castle fortress, La Rocca. I have not had a chance to see the theater yet so I am excited. After the show there is a reception at Galeria Littlewood, a small art gallery and shop. AND after that, we have reservations at Calagrana for a specialty evening of Italian “small plates”. So it is shaping up to be a fun time. I will report back. This entry was posted in Eating, everyday life in Umbria, Umbertide, Uncategorized on July 20, 2015 by Nancy Hampton. di Giallo Angel is back! This entry was posted in Uncategorized on July 17, 2015 by Nancy Hampton. On Tuesday we took the injured Porsche to the dealer so we could find out what that pothole did to it. Sadly, it took out both of the wheels on the right side. This is not a minor thing. We don’t yet know what the cost of repairs will be. Yesterday the wind came up and the heat went down (some). It was so refreshing. Overnight we left all the windows open and it was nice and cool. Today we decided to go somewhere since it was such a nice day. The wind had blown the haze away too! 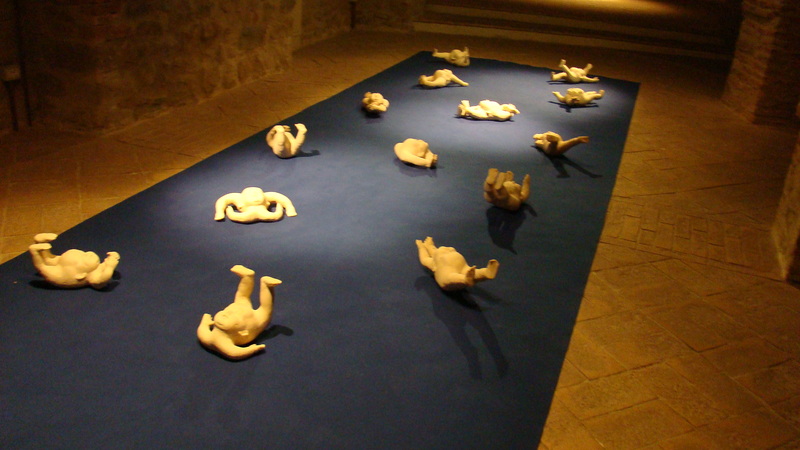 We had read about a ceramics exposition in the town of Cessena north of us. We tootled on up and parked outside of the town. On the way, I spied three of the big glass amphorae beside a dumpster! I have one and it is so pretty so I decided to stop on the way home and get another. As you know the sunflowers are all blooming and I got Luther to stop so I could get a shot. They are just so pretty and these were so abundant I couldn’t resist. I like that there are four or five fields going up the hill. The ceramics exhibition turned out to be a one man show. 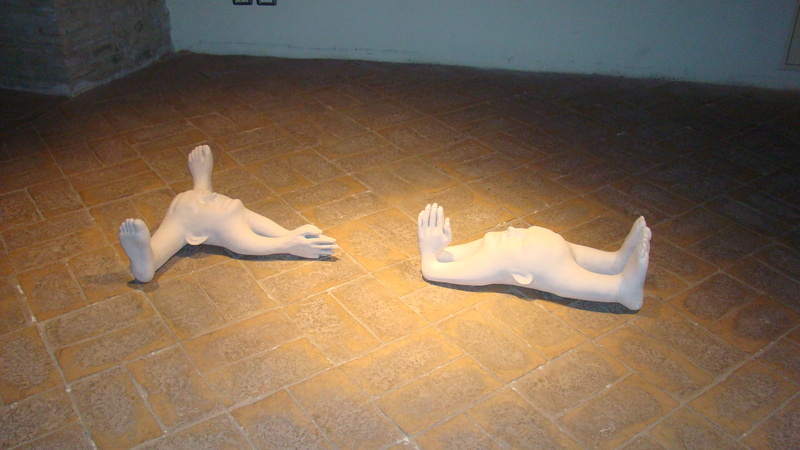 Here are a couple of his sculptures. Strange but interesting. The town of Cessena is a walled hilltop town. We entered it through a tunnel that goes into the old cisterns from which it gets it’s name. Just beside the entrance was this pretty group of flowers with the view behind them. View from the town across the Tiber valley. We checked out another town supposed to be famous for it’s ceramics due to the fact that they have some of the most pure clay in the world. The town name was Fighille. I must do some more research as we found no one selling or exhibiting ceramics. I stopped and picked up the Amphora. I got it in the trunk just barely. Now I have to figure out how to get that wrapping stuff off. 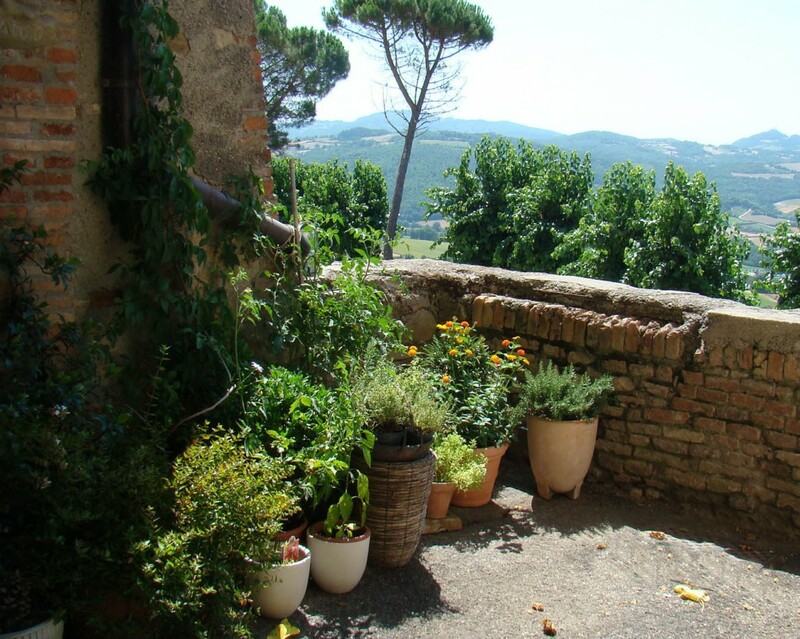 This entry was posted in everyday life in Umbria, Travel, Umbria, Uncategorized on July 10, 2015 by Nancy Hampton. Yay, I am back in beautiful U-town also know as Umbertide. Our trip back from Slovenia in the injured Porsche was uneventful I am happy to say. We have an appointment to take it to the dealer on Tuesday. I hope it is not anything serious. Thoughts on our trip. I liked Udine pretty well. No reason to return that I can think of. Bergenland at the Neusiedlersee was very Austrian if not Alpine. The area is nice. It was unexpectedly cool and wet. The food was not notable but Luther got his schnitzel hit. Budapest is a big, noisy city. The hotel was nice. The people in the city were not very friendly. I, for one will not return to Hungary. The experience with the Porsche dealership there was horrible. It colored my opinions. Bratislava is beautiful and welcoming – I would go back. Our hotel was nice but not spectacular. The food was only OK. Lake Bled in Slovenia was beautiful and relaxing. Our hotel, Berc Garni was very Austrian in feel. Lots of wood. A nice balcony. When a hotel says Garni, in German that means they have no restaurant. But right next door was the sister hotel Berc Pensione. We ate the best food of the trip here, and both nights it was that good. The kitchen was outside which I thought was interesting. Now that I am back in Italy and “at home” I have time to think about our first year here. Our arrival anniversary was June 25, during our trip. I can’t say that I have hit the place that many have written/warned about where I regretted the move. Oh, sometimes I am homesick yes, and I miss my sister but I do not regret that I came here. Life here is infinitely more interesting than my former life. I am constantly stimulated. Whereas, everything in Virginia was so familiar to me that, unless I had challenged myself with some activities outside my norm, I was bored. So, here’s to Italia and my life here. Still having fun! When we got home on July 2, our house sitter moved out and life returned to normal. We walked to the grocery store, the wine shop and the butcher to buy provisions. I got hamburgers to grill on the fourth of July. Also marinated chicken to grill on Luther’s birthday, July 5. The holiday rolled around with little fanfare. Gosh! no fireworks?! What are Umbertidese thinking? It fell on a Saturday so I went to the kilometer zero market to buy veggies. I bought some squash blossoms on impulse. Then I needed to get ricotta to stuff them. Happily there is a stand at the market where there is local pecorino cheese as well as home-made ricotta and mozzarella. Remember that I now am the proud owner of several hot varieties of pepper plants? The Jalapeno had a couple of plump specimens so I roasted and minced them and mixed them into the ricotta and added some panna granna. Then I stuffed this mix into the squash blossoms, made some batter and dipped and fried them. Yum! they were very good. Happy fourth of July! 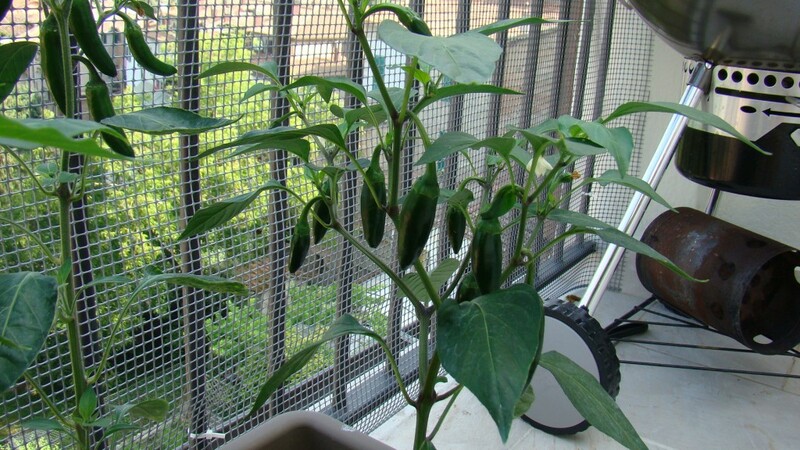 Here is my pepper plant. 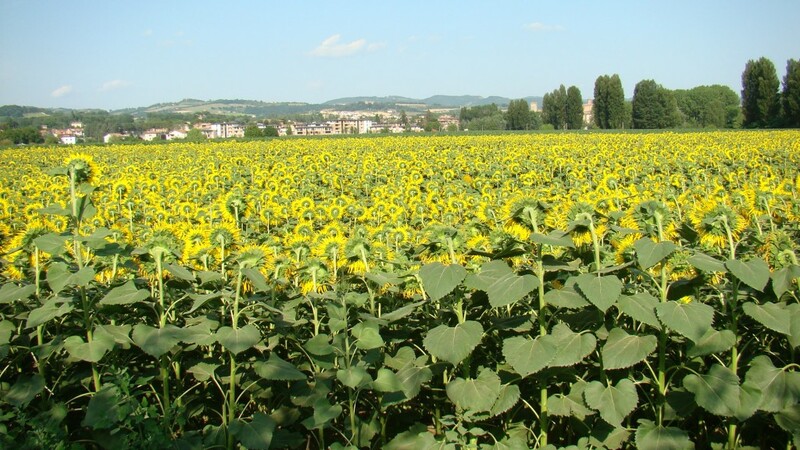 So a few posts back I took a picture of the sunflower fields outside Umbertide. While we were on our vacatiion they bloomed and now are nearly past their prime but I got another picture of them yesterday. It is very, very hot here right now, 98 F! It was about 5PM and they should have been facing us but they were not. SO after all that I couldn’t return without a picture even if their backs were toward me. 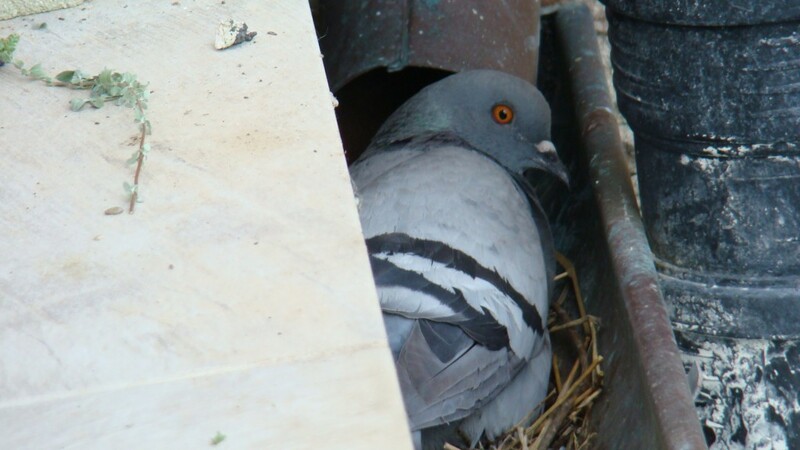 And finally, while we were gone a lady pigeon decided our gutter was the perfect place to set up housekeeping. I don’t know what she will do if we get a thunderstorm. The cats are fascinated and sit by the railing. They can’t see her but they either hear or smell her. They don’t seem to bother her in the least. Here is her picture. Good luck to you pigeon! 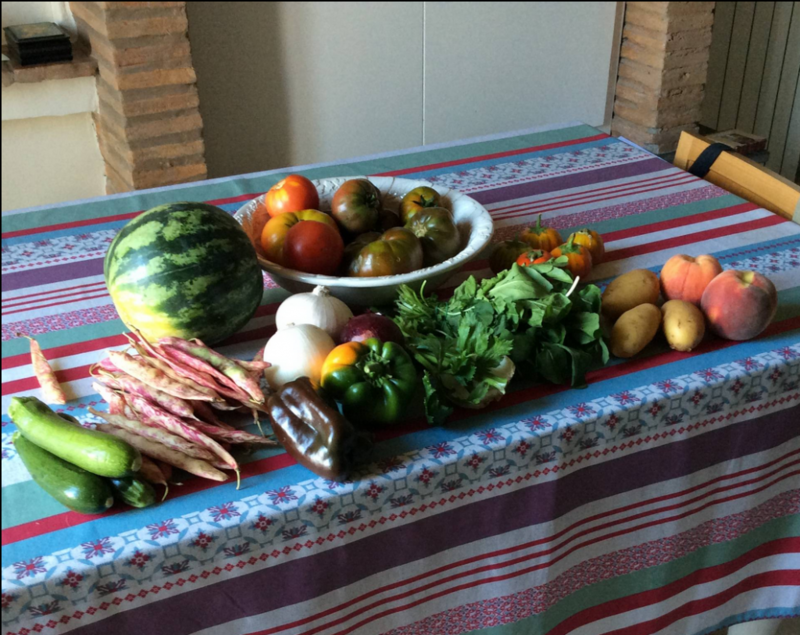 This entry was posted in cooking, Eating, everyday life in Umbria, Travel, Umbertide on July 6, 2015 by Nancy Hampton. What a beautiful day! 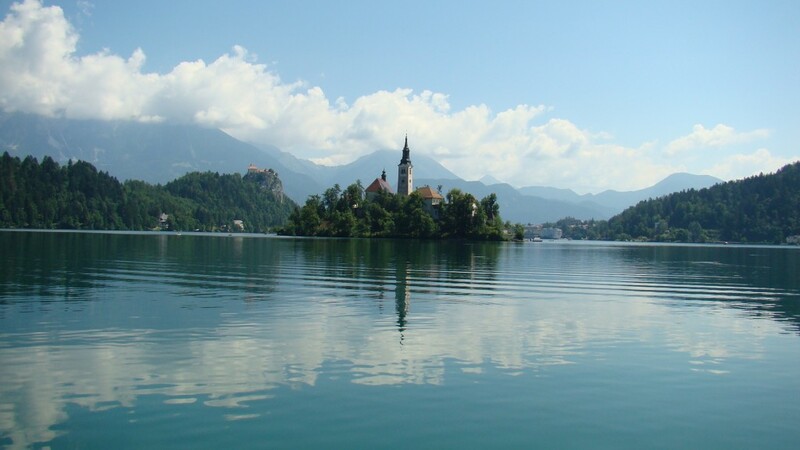 I woke up very sore from my fall yesterday but determined to hike around Lake Bled. And it was a perfect day for it. We started out a bit rocky as we tried a marked path that lead up into the mountains. 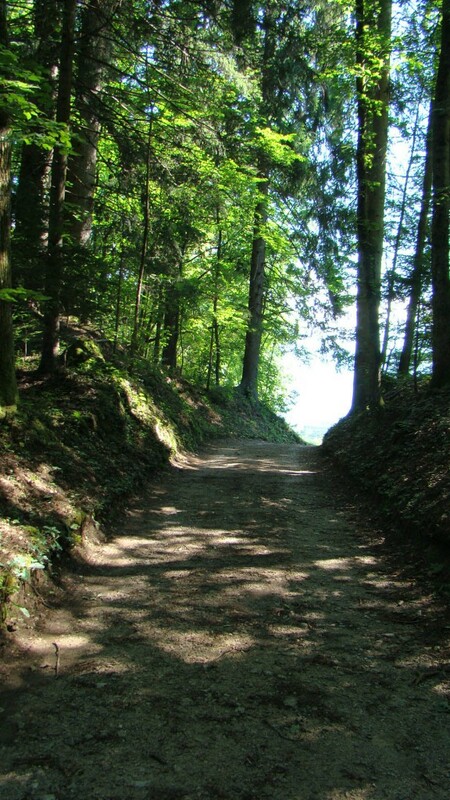 I had really wanted to stay along the lakeside where there is a nice path all set up for bikers and hikers. So we eventually made our way back down. I did take a couple of pictures while up there so here they are. The lake is pretty unspoiled but there are places set up for swimming and sun bathing here and there along the way. You can also swim from just anywhere along the lake. The water is crystal clear, turquoise and there are a lot of fish. We saw many tiny fish, probably baby trout. We also saw some nice sized trout as well. 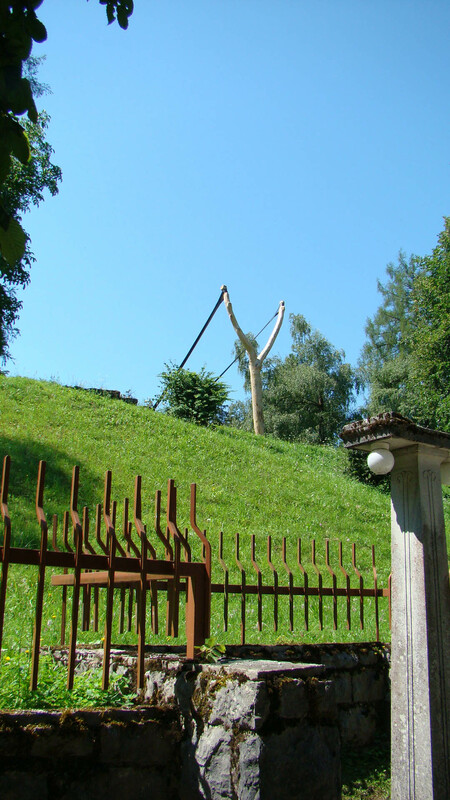 There were also some whimsical things like this gigantic slingshot. Luther commented that if Bled was ever attacked they were all set to defend themselves. I was smitten with the little island in the center of the lake. There is a church there dating from about 1,100 AD. Legend has it that there was a temple to the Slavic goddess Živa on the spot of the present church. It was nearly destroyed by an earthquake in 1509 and rebuilt in the baroque style which we see today. You can only get there by boat or, if you are a strong swimmer you can swim there. You can rent a boat and row yourself or there are boats that take people across in groups. Here are two pictures. On the way back we saw a novel way one restaurant kept it’s beers cold. It was icy spring water pouring from the wall!! 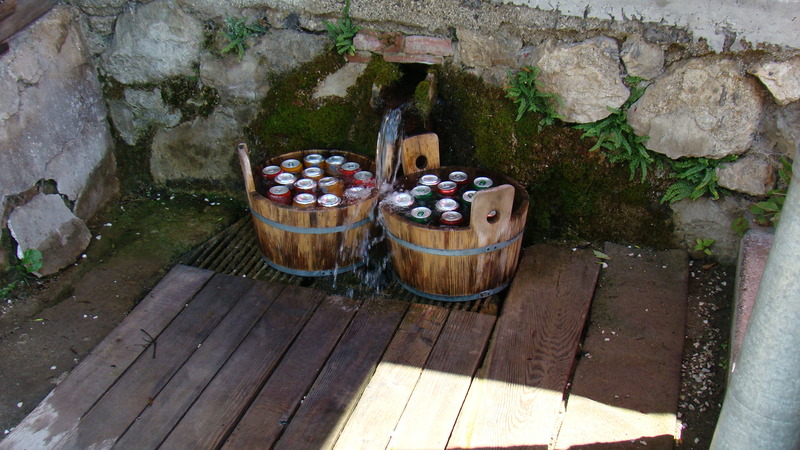 You can’t tell from the picture but the water hit in such a way as to keep the beers rotating in their buckets. 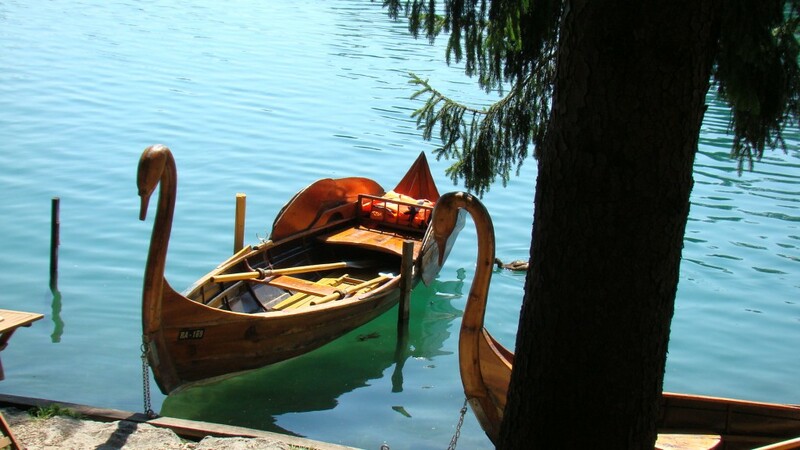 They also had a some really pretty wooden boats you could rent. Here is a unique one that looks like a swan. 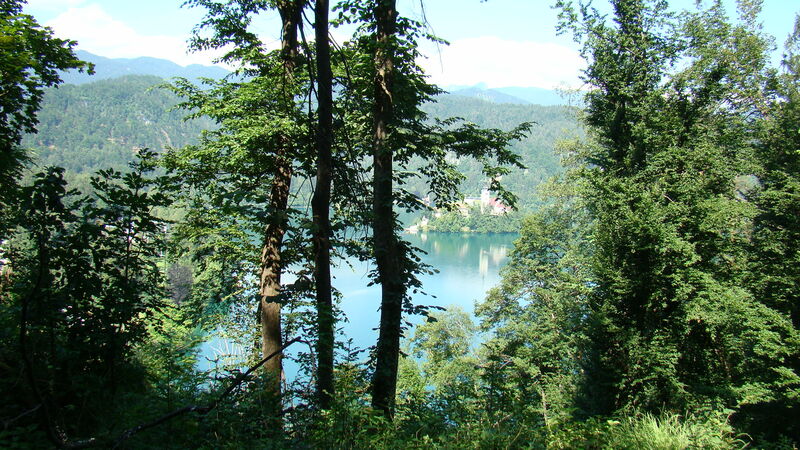 By the time we got back to Bled it was lunchtime and my feet were starting to hurt. Good timing! We were happy to sample the local brews. Tonight we plan to eat where we ate last night as it was very good and right next to our Inn. Then onwards home tomorrow. 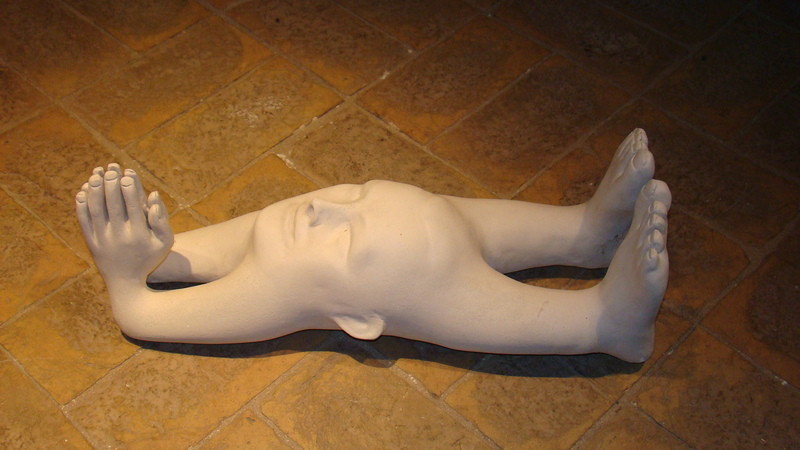 This entry was posted in Travel, Trip Report, Uncategorized on July 1, 2015 by Nancy Hampton. On the way out of the train station, I tripped and fell flat hitting my chin on the platform. Ouch! I did cut my chin which proceeded to bleed for several hours and my jaw and teeth were badly shaken, knees bruised. Just lovely! Well when we got to the dealer the car was sitting right where we had parked it. They hadn’t done a thing. Long story short, the very rude service manager curtly told us they couldn’t even look at it for five days. So we left. The tire was holding air. We were nervous but what could we do? We drove five hours and made it OK. Not a very comfortable trip. Luther got on the phone while I drove and lit some fires under the Italian Porsche roadside assistance people. Finally getting someone who said they could repatriate the car – I guess that means they’d tow it back. And give us a rental. But by then it was too late. Maybe they should have done that sooner. Oh well. 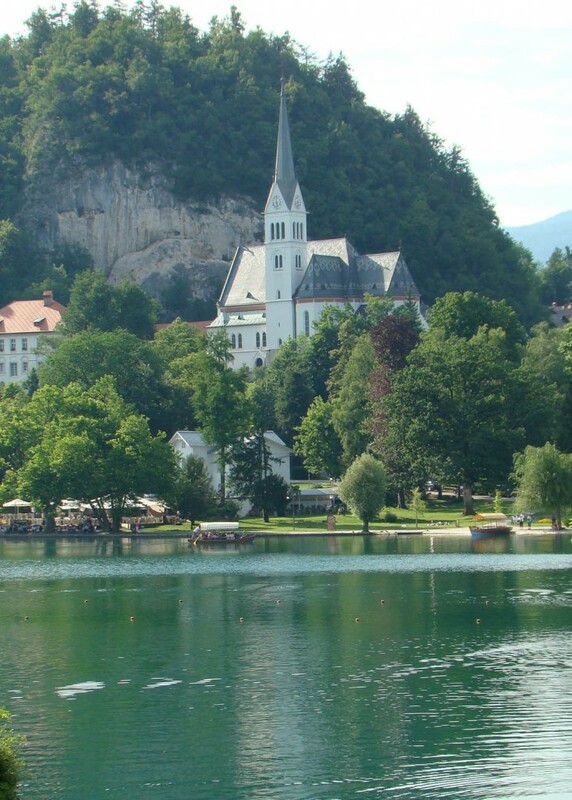 So now we are in Bled Slovenia, our last stop. 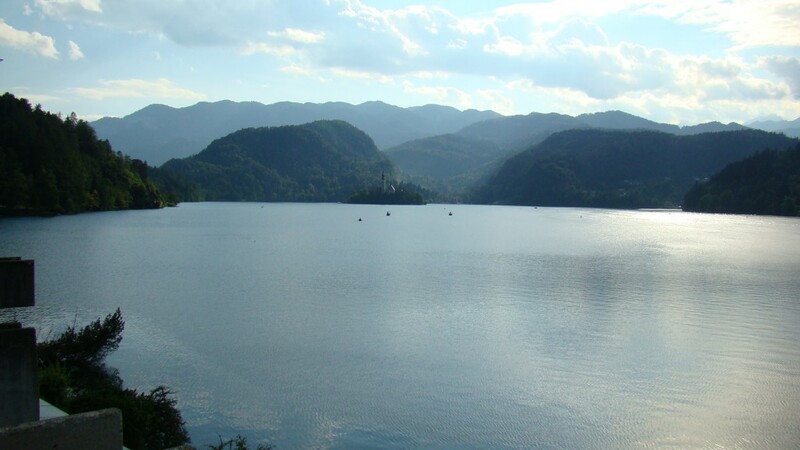 It is a very beautiful place among pretty mountains with a lovely lake, island, 1,000 year old castle and small village. Our hotel is called Blec Hotel Garni. 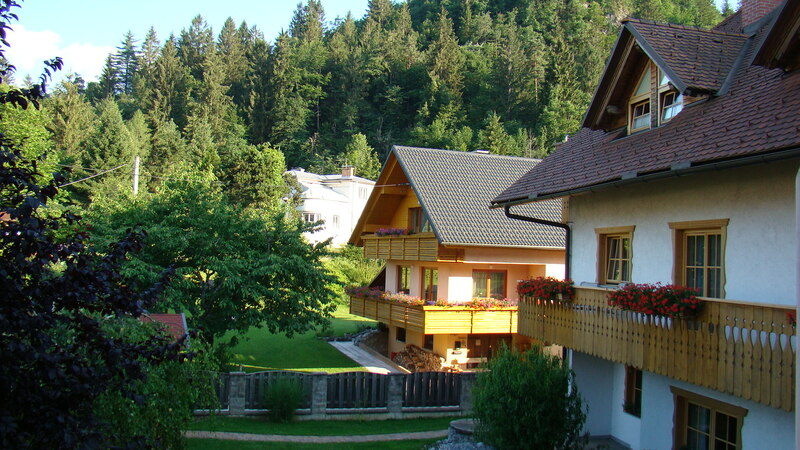 It is extremely alpine with lots of wood and flowers everywhere. We have a nice, big room with balcony. A little worn at the edges maybe but very comfortable. 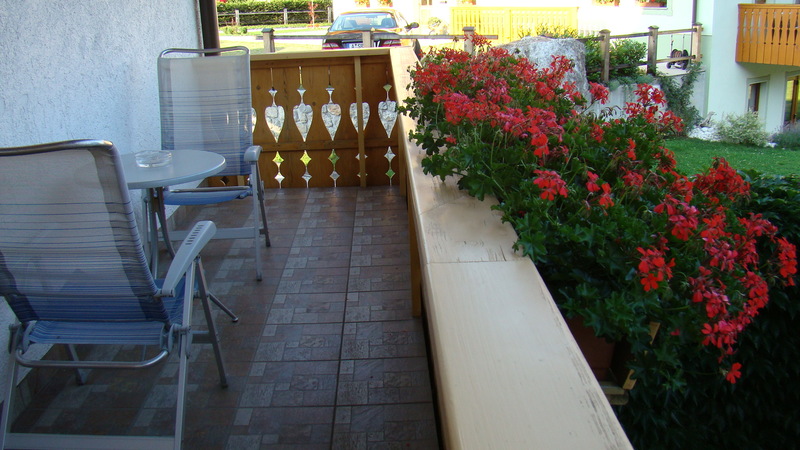 Here is our balcony and the view from it. We took a walk down into the village which is very small. There are a few restaurants and shops. Luther got a couple of bottles of room wine. We sat at an outside terrace beside the lake for a glass of wine and to enjoy the view. This is the village church. This is the island and lake. I am sure I’ll get better pictures tomorrow. We had a very nice dinner at the sister hotel called Pensione Blec. They have very fine dining on the lawn, weather permitting. It was very good. I had black risotto with octopus and a lamb confit. Luther had a cheese and meat plate and mixed grill. I am OH so happy to see the backside of Hungary. I found the Hungarians less than friendly. If you asked me now I would say I will never return. Today we plan a walk around the lake. It is about 6km. I should get some pretty pictures. This entry was posted in Cars, Eating, restaurants, Travel, Trip Report on July 1, 2015 by Nancy Hampton.